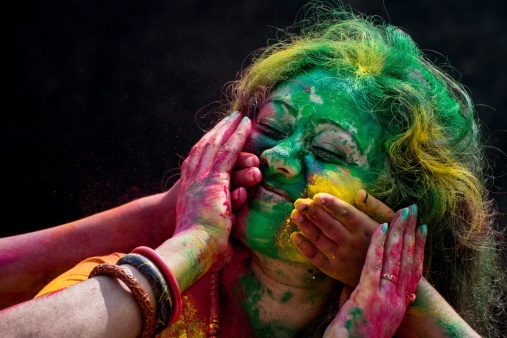 Holi, also known as festival of colours, is predominantly a festival of Hindus. Importance wise perhaps it would only be next to Diwali but in some parts, particularly in the northern India, it is celebrated with even more enthusiasm and fanfare. It marks the end of the winter season and arrival of the spring symbolic to fertility, thrift and harvest. It falls on the Phalgun Purnima, the last full moon day of the lunar month (in February/March). It is primarily celebrated in India and Nepal but many Indians having migrated and settled in various parts of the world, the festival has marked its presence globally as a symbol of colours, frolic and love over a period. As per an old legend, there was an evil king Hiranyakashipu in ancient India with an equally evil sister Holika. The king had a boon that he could not be destroyed by a man or animal, weapon or fire, during the day or night, inside or outside of the house and on the earth or sky. The boon had made him virtually indestructible. He had become so arrogant that he stopped even acknowledging any divine power and declared himself as God insisting that all people must worship only him. However, his own son Prahlada who was a devotee of the Lord Vishnu, disagreed and refused to accept him as the supreme authority. This angered his father and king Hiranyakashipu who subjected him to torture and various punishments. However, Lord Vishnu came to his rescue on all occasions; hence none of the punishments could harm him or deter his resolve. At the end, the evil king ordered his sister to kill Prahlada through fire. Holika was blessed with a cloak which would save her from any fire. She tricked Prahlada to sit in her lap on a pyre with her as she thought she was immune to fire while Prahlada was not. In the process, however, Holika was destroyed in fire while Prahlada remained unscathed with the blessings of God. In the height of this provocation, Lord Vishnu finally emerged in the Narsimhavtar (i.e. half man and half lion), grabbed Hiranyakashipu to hold on his thighs at the threshold during the twilight hour and killed him with his sharp nails. Thus the beginning of the festival with a bonfire signifies the victory of the good over evil, end of the winter (harsh days) and the arrival of the spring (joy and fun time). The festival is used as an occasion for the fun and laugh, forget and forgive as also repair damaged relationships. The celebration starts with the Holika bonfire on the previous night where people gather and freely sing and dance. Following day, the morning is marked with a lot of enthusiasm and fanfare with colours everywhere. Children, old and young people play, chase and exchange dry colours, water guns and balloons with the coloured. The fun and frolic can be observed at homes, open streets and roads, parks, buildings and near temples. People in groups carry dholak, drum and other musical instruments while moving from place to place enjoying fun with colours. They visit families and friends, exchange colours and eat festival delicacies, food and drinks. By the afternoon, the mood of people is usually sobered up and they put on new clothes and visit their elders, friends and relatives to exchange sweets and good wishes till late evening. In the different parts of the country, the Holi has different colours and flavour. In the entire Braj region in Uttar Pradesh, particularly Mathura and Gokul where Krishna was born and grew, the festival has special significance in commemoration of the divine love of Krishna and Radha. The king Kansa, the maternal uncle, made several attempts to kill Krishna in his childhood as he feared that the latter would be the ultimate cause of his death. In one such attempt, he deputed an evil woman Putana who poisoned Krishna with her breast milk. Though Krishna survived but his skin became dark blue due to the effect of the poison. As he grew, Krishna would ask his mother Yashoda in despair if fair skinned Radha and other Gopikas like him due to his skin colour. Yashoda tired of his antics told him to colour Radha’s face in any colour he liked. This led to playful colouring of the faces of Radha and Gopikas. The adolescent love between Krishna and Radha became a legend and even in recent times, the entire Braj region celebrates Holi with such a gusto and fanfare for days. In Uttar Pradesh Braj region, women celebrate playfully hitting men with stick, who in turn try to save themselves with shields. On the occasion, men are traditionally expected to accept whatever women have in store for them. This ritual is called Lath Mar Holi in this region. Barsana, a town near Mathura, celebrates Lath mar Holi in the sprawling compound of the Radha Rani Temple where thousands of people gather to witness this ritual when women beat up men with sticks as rowd on the sidelines become hysterical, sing Holi songs reciting Sri Radhey or Sri Krishna. The Holi colours last for seven days in Kanpur area. In Gorakhpur, since morning people visit every house and sing Holi song and express their gratitude by applying coloured powder (Abeer). In Bihar and parts of eastern Uttar Pradesh, Holi is known as Phaguwa in the Bhojpuri dialect. People light Holika bonfire with dried cow dung cakes, wood of Araad or Redi tree and grains from the fresh harvest. The following day, the festival is celebrated with colours, frolic and fun. People sing folk songs and dance to the tune of dholak besides consuming intoxicating bhang with pakoras and thandai. At certain places people also resort to celebrating Holi with water solutions of mud or clay. Apart from its religious and cultural significance, the Holi also marks the beginning of new year as per a Hindu calendar. Many people use this festive occasion to end their old enmities and rivalries amending their past errors and follies. Traditionally, such proposals are never refused ending old conflicts with a spirit of forget and forgive. On the occasion, many people pay or forgive debts as also prefer to enter into new deals. Days before the festival, shops start selling colours and sweets. Well ahead of the auspicious occasion, communities put an effigy to signify Holika and start gathering wood and combustible materials for the bonfire at the designated spots. People stock up colour pigments and made and/or store delicacies, drinks and festive seasonal foods such as gujiya, malpuas, mathri, and other contemporary preparations. By and large, the festival is celebrated in all parts of the country with vigour and enthusiasm and regional variations. 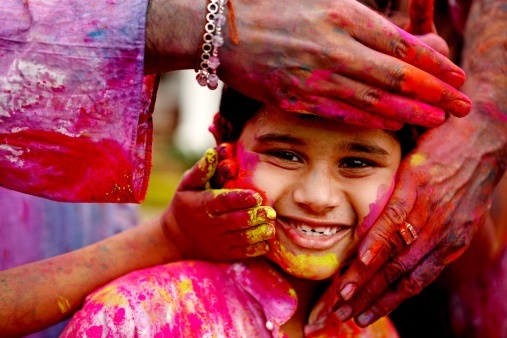 In the western region, Gujarat celebrates Holi with a lot of enthusiasm. People lit the bonfire offering raw coconut and corn to the fire. The following day is marked with the festival of colour or "Dhuleti" in a traditional way exchanging colours and sweets. Dwarka, a coastal city of Gujarat, celebrates Holi at the Dwarkadheesh temple with fanfare, music and festivities. In Maharashtra, festivities last for five to seven days. Holi Purnima is celebrated as Shimga and is characterized with the bonfire followed by traditional colour celebrations. In many parts of the western India, a pot of buttermilk is hung high on the streets and young boys try to reach it and break it by making human pyramids. The girls try to stop them by throwing coloured water on them to commemorate the pranks of Krishna. The boy who finally manages to break the pot is crowned the 'Holi King'. Afterwards, the men, who are now very colourful men, go out in a large procession singing and dancing. In the eastern region states like Bengal and Odisha, the festival is celebrated in a more sober and dignified manner, particularly in Bengal where it is known as Dol Jatra. Icons of Lord Krishna and Radha are placed on beautifully decorated palanquin to take around streets in the cities and villages. People dress up well, sing and dance, exchange coloured water and abir and prepare traditional dishes like kheer sandesh, malpoa, basanti sandesh, payash etc. In Odisha, icons of Lord Jagannath are used in place of Krishna and Radha. In the southern India too, Holi is celebrated with enthusiasm though with less colours and frolic compared to northern parts. In Andhra Pradesh, the Holi is a major festival with fire and colours. In Tamilnadu, the Holi is celebtated as Vasanthosavam characterized with decoration, dance and music. The colours are also used on the occasion. In Kerala, the Holi is called Manjal Kuli in Malayalam and Ukkuli in Konkani. In Karnataka, the festival is celebrated with folk dances and bonfire, and households prepare special food dishes. However, the occasion is not without some inherent evil customs. The most common being the widespread use of intoxicants like charas (or hashish), ganja and bhang. All three intoxicants are traditionally associated with Lord Shiva. Of these, the bhang has become a sort of an official drink which even many educated and enlightened people (men and women) take on the occasion along with thandai. During Holi, there is a tendency to over-do bhang with thandai. These intoxicants bring a feeling of euphoria and enhance mood but over doze may have several side effects and harm to health. Sometimes use of these intoxicants, mud and forced colours even lead to quarrel and fights spoiling the festival and fun. Thank you so much, Rao Saheb. Belonging to north I have tried to cover in a concise manner to keep article handy and less time consuming for those who are genuinely interested but it suffers with the defect that it doesn't give enough account of how it is celebrated in southern states. Regards and best wishes for Happy Holi.